Dont Leave Your Dog In The Car! Temperatures are hitting 40degrees in Spain. The beaches of Costa Blanca are full of Spaniards, expats and tourists enjoying the warm sand, the sunshine and the sea … but what about your dog? You didnt leave it in the back of the car, did you? 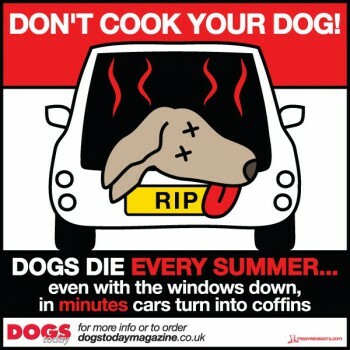 Cars are no less than death traps for dogs in the Spanish summer! The car will warm up to unbearable temperatures in just minutes under the Spanish sun, even if in the shade, and a dog trapped in there will dehydrate and die within a very short timespan. 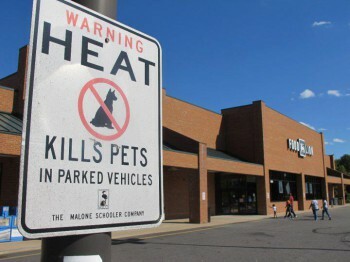 DO NOT leave the car locked with the dog inside, even if you are just going inside for a bit of shopping or heading to a restaurant for a bit of lunch – a extremely dangerous to the dog and it will die much quicker than you think! 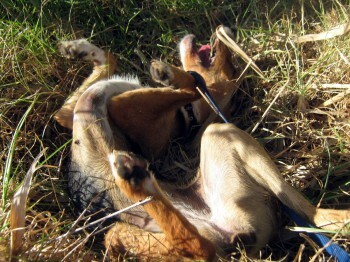 Heat Kills Dogs – The Extreme Spanish Heat Kills a Dog in a matter of minutes! It may seem like common sense, but dogs die every day in Spain in tragic events where owners have left them in their cars. 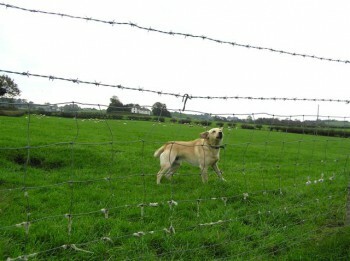 The owners intent is rarely malicious but the outcome is a horrible death for the dog nonetheless! The International Festival in Javea is happening right now in Avenida Augusta between the Port and Javea old town. 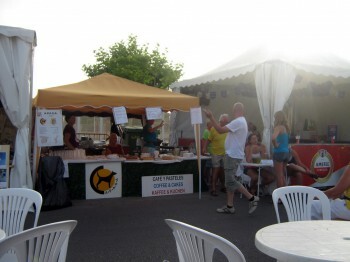 The main feature of the festival is culture, music and food from more than 21 participating countries … but there has been made room for APASA, the local Javea dog charity too. 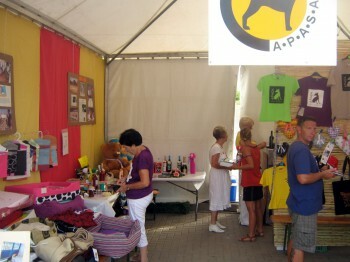 The APASA Javea stand at the International Festival has plenty of information about the dog rescue efforts, merchandise and plenty of ways to support APASA. But … to those of us with a sweet tooth the APASA stand is a nice stop for a bit of dessert or a snack during the festival too. They have a wide range of homemade cakes and pastries, miniature pancakes and plenty of other sugary goodies to go with a cup of fresh coffee or a cold drink. Its a real little oasis in the busy festival! Come on down to the Festival and dont forget to visit the APASA stall for a doggie chat, a yummie cake and a coffee! Last night a nice charity event for APASA was held in La Font Santa Moraira, a small park just outside of the village. 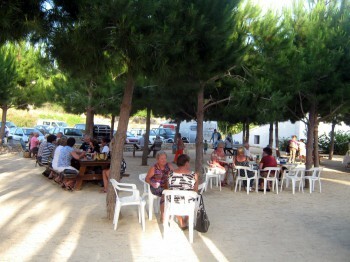 The event featured a tombola, food, music and a relaxing time in the evening sun of Moraira. The band was a covers act called The OK band – quite a telling name one might add – but the atmosphere of the event was very pleasant and tranquil, the weather showed itself from its nicest side and even yours truly, the old Grump, had a good time. Personally, I spent 10euros in the tombola – and won nothing lol … luckily I had with more luck with the food and munched two yummy homemade burgers. Personally I didnt have a dog to bring, but quite a few cute doggies were parading the La Font Santa park on the beautiful evening in Moraira – and hopefully the event raised funds for making even more of the APASA dogs happy! 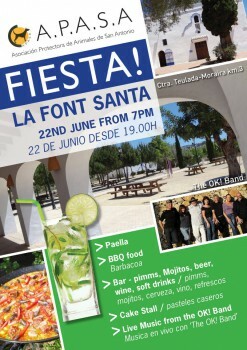 PS: Dont forget the Friday evening charity event for APASA Javea – it is happening at La Font Santa near Moraira. Featuring a nice chilled evening in a lovely park with live music, tombola, bbq, paella and refreshments – come along for a pleasant evening with fellow dog lovers on Friday June 24th from 7pm till 10pm! PPS: If you want to take a dog for a walk – APASA in Javea have all sizes, temperaments, breeds and ages ready and longing for a wander round the area – check out the APASA Javea website for more info. Fancy a Friday night with plenty of fun, live music and paella? Come along to the APASA fiesta and fundraiser at the lovely recreational park La Font Santa between Teulada and Moraira. The APASA fiesta kicks off at 7pm Friday evening with freshly cooked yummy paellas and BBQ out in the open and plenty of refreshments such as mojitos, wine and soft drinks in the bar. Cake, cake, there´s a stall with homemade cakes and other goodies to explore as well … Play on the tombola, chat with new or old friends, bring your dog if it fancies a night in the park. The entertainment is provided by the Ok! Band performing a live concert outdoors. 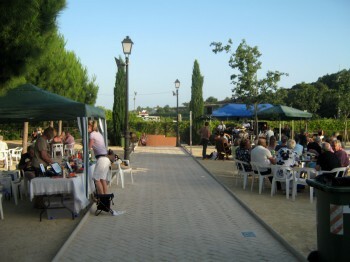 The park La Font Santa is always worth a visit but even more so this Friday evening from 7pm. Enjoy excellent food, drinks and live music with fellow dog lovers – and help support the amazing efforts of the APASA Dog Charity and Rescue Kennel! Don´t forget. Load your family, friends and dogs in the car this Friday evening – and head to La Font Santa for a great night of live music, paella, bbq, mojitos and fundraising for your local APASA dog rescue! A bit of love and affection. The chance to explore the fields, experience the many exciting smells or have a crazy run by the river … that may be all it takes to give a dog the best day in ages. If you have the time it really is worthwhile to nip over to APASA in Javea, take one of the kennels rescue dogs with you and head out for an hour of fun. It is isnt just a pleasure for the dog – it cant help but put a smile on your face when you discover just how happy the dogs are to be taken out. Its a tiny little thing to do for you, but you get rewarded tenfold in affectionate happiness … and the dogs have a blast! 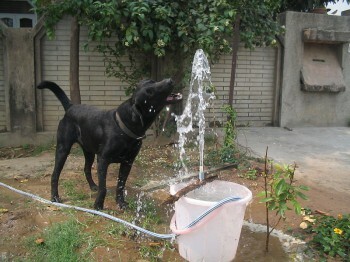 We went down to the roundabout with a fountain near the APASA kennel and had a mad splosh about for an hour. Nothing is better than silliness in the cool water when the temperature is above 35 celcius and you just had a long walk and run in the fields. YAY ! 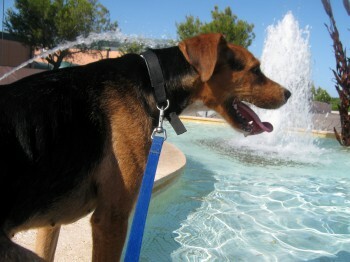 Sticking your doggy nose into the fountain to splosh the water around everywhere is the best thing ever! We were soon soaked from top to bottom – both of us. YAY! Drying off by rolling around the grass like a lunatic is the best thing ever! Luckily it doesnt take long to get dry and warm in the Spanish sun … time for a bit of playtime in the bamboo forest – a never ending source of exploration with lots of strange little things to examine, new exciting smells and a real sense of jungle. Phew, all that fooling around is exhausting. 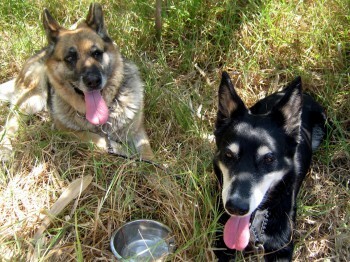 Sitting around having a break, cuddle times and a drink … before heading home to the kennel after a fun afternoon for us both. If you want to have a bit of fun and make a dog happy at the same time – just head on over to APASA Javea during opening hours and ask to take a dog for a walk. They always have plenty of dogs who would looooooove a walk! Leader Of The Pack – Assume Responsibility! A dog is generally a social being with lots of loyalty and affection to spare for those it gets attached to and shows it respect. That only makes it even more sad when the bond of trust between the dog and its family, the humans, is broken. 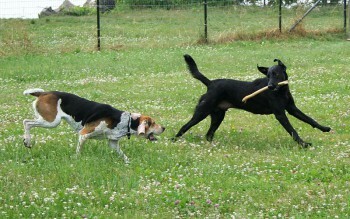 A dog is happiest when it belongs to a pack in whatever role it might fit into. 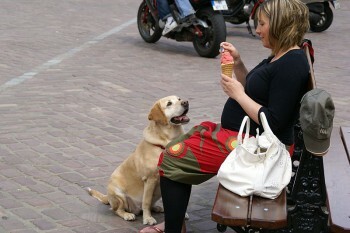 In the case of a pet, the humans are the pack and one of those humans is the leader of the pack in the eyes of dog. As a consequence taking on a dog as part of the family is a responsibility, not unlike having a child. The responsibility is yours to look after the well-being of your dog, keep it happy and healthy, and in return it will go out of its way to please you, adore you and show its uncompromising love. … it may seem like a lot of hassle to search for a new family for the dog, but it is after all a responsibility you chose to take on. The list sadly continues with every line depicting another disgusting crime against an animal that was up until then a loving member of the family. And these are not cruel acts committed by uneducated third world people who simply doesn’t know better. A vast number of the abandoned dogs stem from expats going back to England, Germany or where ever they may be headed and simply not bothering to make arrangements for their dog to come along or find a new home in Spain. Imagine the guy who locked the dog in a villa. In 40degrees with no water or food and without giving notice to anyone. The dog only to be found weeks later when the rental agent comes round to check why no rent is being paid and emails not being answered. That guy is now sitting in his local pub in Bournemouth or Bristol telling people how he was heartbroken he couldn’t bring the dog with him and he hopes it found a new home. Well it didn’t! It died a horrible death of starvation or thirst whilst in despair about its beloved pack having gone missing. 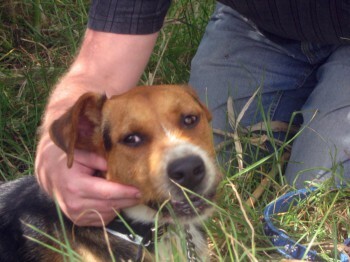 The dog that was found chained to the rubbish bins. A week earlier it was having the time of its life playing in the garden or round the pool of the big villa in the expat urbanization with the family kids. The kids are still playing in the garden with a dog, only in another country and with a new dog the parents kindly gave them as the kids were sad about the old one not being able to come. Why wasn’t it? Because it was just too much hassle to go to the veterinarian and get a passport? Too expensive to book it on a flight to England? Whatever the reason, the responsible adults chose the most vile and horrid solution of all. They took the dog out with the trash and left it there to die. The examples are scarily easy to find, disgustingly common and those capable and willing to commit these crimes are not sent away to a prison cell, in fact, they rarely even have to be confronted with their sickening acts of malice towards a living soul who loved them and depended on them. Break the chain dear leader of the pack. Assume the responsibility that is yours! PS: All the examples above are real and sadly from Javea. I hope none of you reading this will ever add yourself to the list – but further it would be nice if you could in some way support the efforts of those fighting tooth and nails to help these abandoned dogs, get them back to health and happiness, find them new loving homes … please head over to APASA Javea and give them whatever support you can! I went and met Suzy for the very time when I took her for an afternoon of walking, running and playing around Jávea. 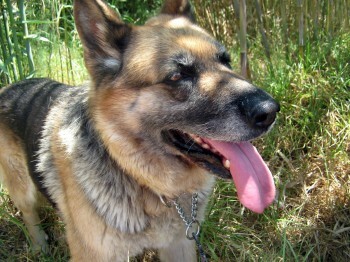 Suzy lives in the APASA kennel and really should find a new permanent home with people who love her. Because the thing is, as long as we were in the kennel with lots of dogs barking and pouncing about, Suzy was acting all nervous and wild. She jumped in all directions, wouldn’t let me touch her and was visibly scared. It all changed completely as soon as we had walked for 5 minutes alone. She calmed down, became talkative and as we had spent just a little time talking and playing she became very placid and affectionate. 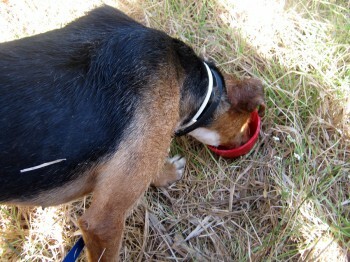 Of course, every dog is an individual little personality with its own experiences and preferences. 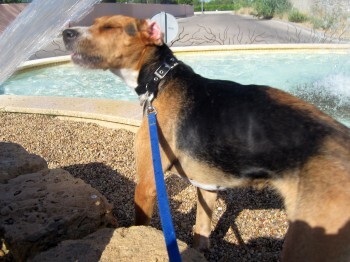 Some probably love the social life of the kennel and the company of all the other dogs. In Suzys case it clearly makes her crazy and scared to have so many dogs around her at all times. All I could do was take her for a couple of hours of relaxing fun on her own and the hard working people of the kennel of course do not have the resources to give her a special kennel home away from the other dogs. The APASA people clearly love dogs – and they do an incredible job, but for a dog like Suzy I think the only solution to give her a happy life is for YOU to help out. If you live in the Javea area and consider adopting a dog, go and meet her. Take her for a walk and get to know her. 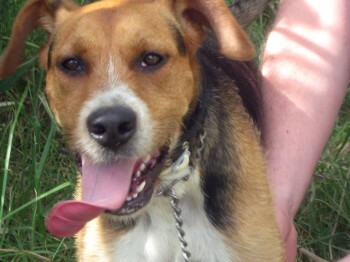 You will very soon find out that she is a wonderfully affectionate dog with an adorable personality. Please give her a chance for a bright future with your family, I promise she will give you plenty of rewards back in form of love, loyalty and fun times! Please consider going to the APASA Javea Dog Kennel and meet Suzy or some of the many other lovely dogs waiting for a new home with a family to love!